Home » Entrepreneurship Training » HOW TO GET TARGETED SALES AND NETWORK MARKETING LEADS WITH FACEBOOK ADS. HOW TO GET TARGETED SALES AND NETWORK MARKETING LEADS WITH FACEBOOK ADS. Are you challenged with trying to get targeted sales and network marketing leads for your business? If you want to learn a surefire way to get sales and network marketing leads, recruit them, and make more money on Facebook, this is the training you should get. If you want to start printing your own money from Facebook right now, this post is for you. As you know, Facebook is the largest social network with over 1.9 billion monthly users. Surely you can find some sales and network marketing leads there! Most salespeople and network marketers seek out people and try to make contact with them. Chances are, the majority of those people have no interest in your business. Finding the right people that actually want to work with you is the key. You can do that by attracting targeted sales and network marketing leads that are interested in what you have to offer. 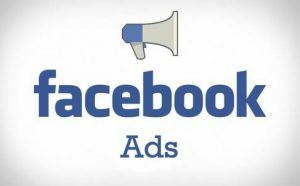 In this post, I will help you learn about the best methods to attract leads using Facebook ads. You may be rolling your eyes about using Facebook ads but stick with me, because what I am about to share with you is proven and powerful and a game changer. Yes it is possible to promote network marketing using Facebook ads but only if you do it in a certain way. The key elements are to create an offer – have something that your target audience wants and is willing to pay money to get. Use an image, it needs to be relevant with a small amount of text (max. 20% of the image) otherwise it won’t pass Facebook’s advertising guidelines and, of course, post your advert! The image is a very important part of your advert. I know someone who works in Internet Marketing and generated 366 leads using Facebook advertising with just one advert, and he promotes a network marketing business. He spent $580 on the adverts but with that number of leads he would only need, say, 6 people at $100 to join him in his business and the advertising campaign would pay for itself. Highly possible with 366 leads, particularly as he has an avid fan base. There are certain guidelines to help make a Facebook advert stand out. One them is this. Now this is where the rubber meets the road, the targeting, when you define the audience. Facebook is against false claims, which it considers unsubstantiated, so do not mention affiliate marketing, MLM or network marketing, just never mention those words at all, and you’ll be fine or it won’t pass your advert. When targeting, you will be targeting some network marketers or some people who would want to know how to market their business better. One of the things when you fill out your Facebook profile, it’s all for advertisers’ benefit when you put your interests in there, just in case you hadn’t realised that (when you put in what films, books and bands that you like.) It’s a way to target you. So, target Eric Worre, Network Marketing Pro – 440,000 people – like that so that would be a well-defined audience for you that you could put your ad in front of. You could also target people in affiliate marketing, or you could target specific companies etc. Building an audience is important as people come to Facebook to socialise. This is building a following of people who know, like and trust you. So you need to create and build a fan page, it’s not necessarily about the high number of followers, it’s about engagement. If you build a loyal following who trust you as an authority in your field they will buy from you. Then, of course, how to connect with people on Facebook and turn “Conversation to Conversion” is a whole other lesson. Check how to do this in our next masterclass. And I know someone who went from crying on the bathroom floor, literally turned herself from “Zero to Hero” enabling her to recruit over 100 people in less than 18 months and create over $10k a month income into her network marketing business. If you’d like to know more about that and how to get your hands on her EXACT formula, go to here. 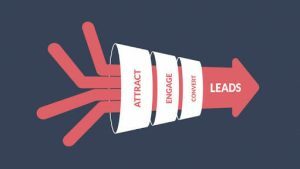 What are targeted sales and network marketing leads? Targeted sales and network marketing leads are people that are actively searching for a way to earn extra income through a home based business. Too often network marketers put their message in front of everyone in hopes that someone will take interest. The best strategy is getting your message front of people who are already searching for and willing to learn more about your business. As a salesperson and a network marketer, leads are the lifeblood of your business. Without leads or people to talk to about your business, you don’t have a business. Those days of posting the link to your business a hundred times a day are old. People are tired of seeing that type of spam all day long. Instead, attract people in a way that creates engagement and conversation. That’s the best way to get network marketing leads to talk with about your products or business. Do you have $5 that you can spend in a day? What if you get 20 leads from it? There are a few different type of ads you can set up on Facebook. The engagement post is a particular type of ad that can help you with sales and network marketing lead generation. It takes just a few minutes to set it up and you can use it over and over. So, set it up one time and use it for a year if you want! 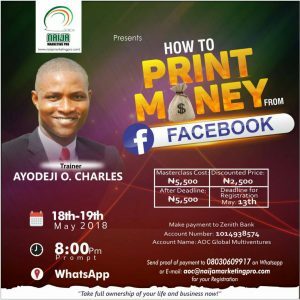 If yes, click here to know what our how to print money from Facebook masterclass is all about. Once you have your Facebook post, you can create a Facebook engagement ad from that post. When the ad is running, people will like and comment on your post. You can actually see the people who liked your ad. Many of the people who liked your ad, have not liked your Page. You can easily invite them to Like your Page and be followers. Engage with those who comment. Create conversations with the people who commented on your Facebook ad post. You can then reach out via Facebook messages to get to know this person. Send them a message asking what prompted them to respond to your ad. Then you can find out the pain points of this individual and take the conversation further based on their needs. The next step is to take the conversation to the phone. Here is the exact training I used to learn some cool methods to recruit for my network marketing business. Facebook ads are one of the most poweful sales and network marketing lead generation method. Be sure to attend this masterclass. You will get exact instructions on how to do it. That’s exactly how I learned. It’s very simple! « WHAT TO SAY TO GET YOUR PROSPECTS INTERESTED AND EXCITED ABOUT YOUR PRODUCTS, SERVICES OR OPPORTUNITIES. Of course there, you can use attraction marketing but Facebook ads places you in front of the people who wants what you are promoting. I hope this serves you well DAVID?